This was a book I got in a Book of the Month and one that I was a little skeptical about. "When a group of neighborhood women gathers, wine in hand, around a fire pit where their backyards meet one Saturday night, most of them are just ecstatic to have discovered that their baby monitors reach that far. It’s a rare kid-free night, and they’re giddy with it. They drink too much, and the conversation turns personal. By Monday morning, one of them is gone." Kristin suddenly disappeared and no one knows anything. What everyone does know is that her husband is sketchy and they were in the middle of a divorce. They know that the husband was not the real father of her twins, and he is not who he seems. There are a few subplots that are tacked on along the way, like the reaction one of the neighbors, Clara, has to the revelations about Kristin's husband. Clara had experienced something traumatic that brings memories flooding back and makes her more aware of surroundings. Another subplot was the new neighbor, Izzy, dealing with her own issues like being in love with her sister's husband (which was really hyped up to be something but it was really nothing. The dumbest part of the book!) Soon enough, Izzy is fully thrown into the drama and it definitely makes for an interesting twist. I have to say, this book is very slow and you're constantly waiting for the other shoe to drop. Because of that, I went through the book pretty fast because I was a little bored. You're trying to figure out what actually happened to Kristin while still trying to be invested in the other subplots. That is, until the last few pages. I was so stunned I had to go back and re-read everything to make sure I was getting it right. It was an incredible twist, the most epic ending I've ever read because I never saw it coming. It was like the first time I read Gone Girl -- I was stunned and couldn't have seen that coming from a mile away. All the negatives of the book aside, it's well worth the read to just get that super satisfying ending. 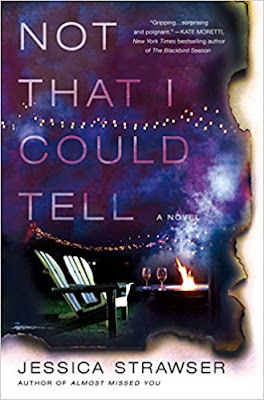 Have you read 'Not That I Could Tell'? What did you think?